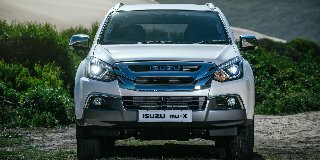 View the latest Isuzu MU-X vehicle specifications below. The Isuzu mu-X is a versatile, comfortable and spacious vehicle, suitable for navigating peak-hour traffic, off-road adventures and fun trips with the family. All those trips will be easy on the pocket in the Isuzu mu-X as it offers superior fuel economy without compromising on power or torque with its 3.0L Turbo diesel engine.